I’ve heard many interesting drashot on the plagues, but to me the unifying factor of all plagues is that they are chaotic. In the Creation narrative, the world is tohu vavohu, “formless and void,” some translations say, but fundamentally, chaos. God hovers over it all, and speaks, and by speaking, separates dark from light, one thing from another, until the world is organized and peaceful. Now, in Exodus 8 and 9, here come the plagues: water turns to blood, frogs swarm out of the Nile, then die and stink. The dust that is everywhere turns to lice, tormenting man and beast, followed by flies, which bite and swarm and carry filth everywhere. Then disease: first the cattle begin to die of anthrax and hoof-and-mouth disease, and their meat and milk are no longer good, then human beings are struck with boils that erupt everywhere on their skin. The sky goes crazy, raining hailstones that cut the crops to shreds, and locusts gobble up everything that’s left. Then the sun and moon fail, and the chaos seems complete: all is dark, itchy, sticky, dis-eased, and there is nothing decent to eat or drink. And then the human promise of a future is erased: firstborn children die. Tohu vavohu: Creation is unmade and all is chaos. I read those passages in Exodus 8 and 9, and I think of all the suffering people and animals. Pharaoh and the Hebrew God have their confrontation, and I am angry at both of them. They are like politicians talking about eggs and omelettes. “You have to break a few eggs, etc.” — NO. I understand that I am supposed to root for God, and cheer, and I just can’t bring myself to do it. 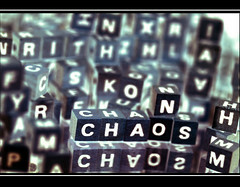 In a bad year, on a bad news day, we can feel the chaos all around. Two days ago a crazy man shot and killed seven people at a little college in the city of Oakland. I’ve been involved in a conversation on my local Patch.com site (San Leandro) about the fact that little San Leandro seems to be in the midst of a plague of violent crime that has become so commonplace it doesn’t even make the news. People are angry. We feel helpless. We feel like Egyptians. What are we to do? I keep thinking of the line from the Mishnah: In a place where there are no human beings, be a human being. (Pirkei Avot 2:6) In the midst of the mess, whoever made it, we have only our humanity, our ability to connect to other suffering beings. So let’s reach out. Let’s talk. Let’s touch. Let’s quit fantasizing about how great the world would be without plagues and instead, reach across the mess to one another. I don’t know how else we can navigate, in a time of plague. We have the example of God in Creation: the power of words. Somewhere in there, we seek holiness. This post is part of the Blogging the Exodus project. A group of rabbis are blogging from the 1st of Nisan to the beginning of Passover on Passover topics. 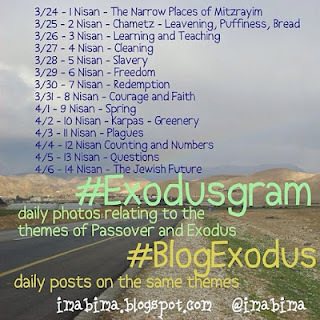 If you want to discover some great rabbinic blogs, or some interesting things to ponder as you clean up the chometz, you can locate those blogs via the Twitter hashtag #BlogExodus. Next Next post: Do You Ask Enough Questions?